How can we best attract new ZLAC members? How can we provide “value for membership” and foster member engagement/participation? COME JOIN US ON THE TERRACE! for the Terrace Luncheon at ZLAC! Purchase tickets using the link below. Or make your check payable to “ZLAC” with ‘Terrace Luncheon’ noted in the memo section. Checks can be mailed to ZLAC (c/o Marilynn Wyatt, 1111 Pacific Beach Dr., San Diego, CA 92109). Please indicate when you RSVP whether you would like chicken salad or vegetarian salad for your main dish. What is Ayurveda? How does Ayurveda promote health and longevity? $25 per person – All Welcome! Learn the basics of Ayurveda by taking a questionnaire to determine your body constitution, understand the traits characterizing your body and mind, and identify food and lifestyle tips that keep each dosha balanced. Presented by Beth O’Shea (XIV) as part of a 1-year certificate Program in Ayurvedic Wellness Counseling. for a Padres Game at Petco Park! Or make your check payable to “ZLAC” with ‘Padres Game’ noted in the memo section. Checks can be mailed to ZLAC (c/o Keara Farrel, 1111 Pacific Beach Dr., San Diego, CA 92109). 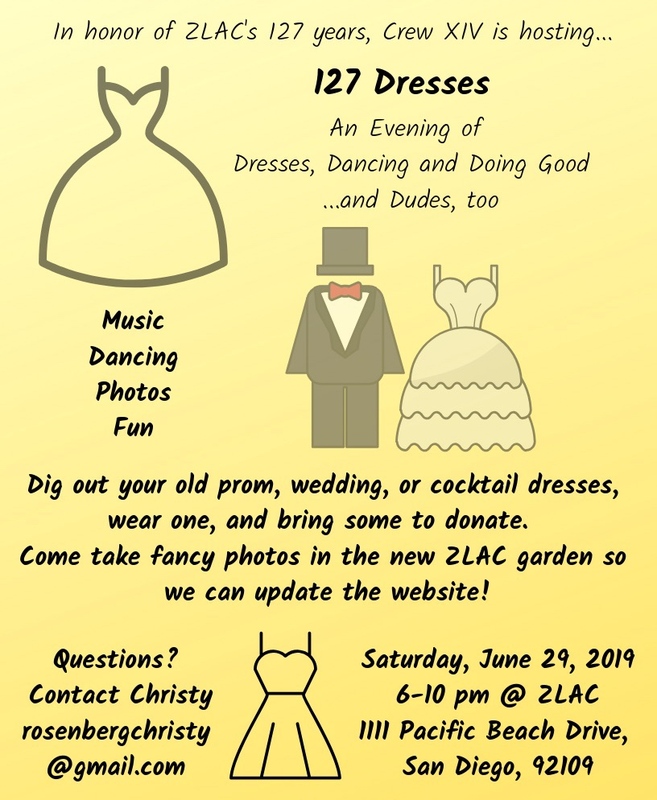 Please join us in our annual welcome and celebration of members who have joined ZLAC in the past year. Sponsors are particularly invited to attend and introduce the new member(s) whom you have sponsored to the membership at large. This is a fun and relaxed evening, with dinner and camaraderie! GRAB YOUR PARTNER, DO SI DO! for a Hoedown at ZLAC! Purchase tickets using the link below. 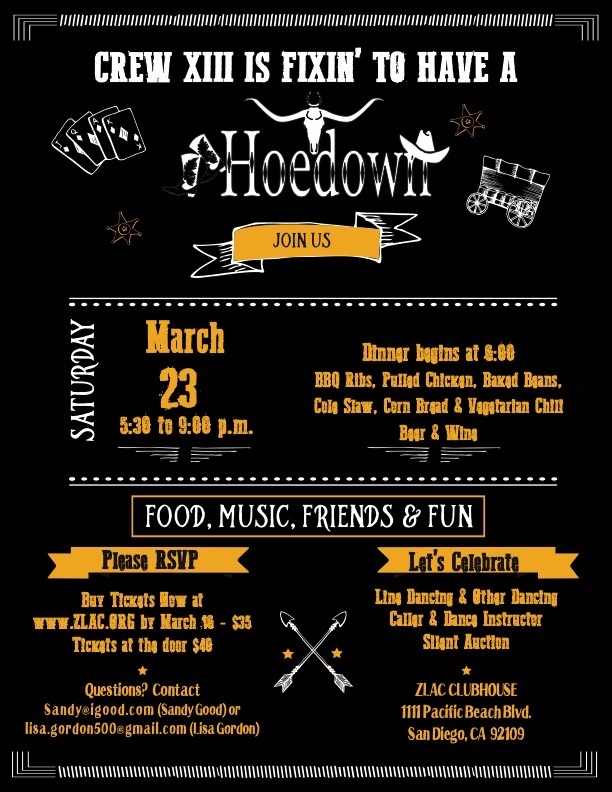 Or make your check payable to “ZLAC” with ‘Hoedown’ noted in the memo section. 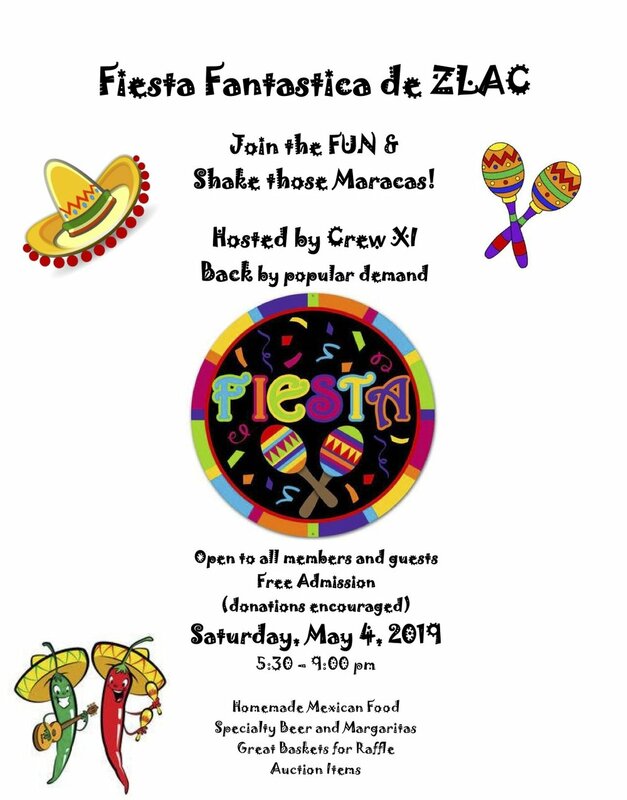 Checks can be mailed to ZLAC (1111 Pacific Beach Dr., San Diego, CA 92109) or placed in the folder marked “HOEDOWN” in the boathouse. You won’t believe how beautiful the garden is! Come hear what we have done, and what’s still in the works! Come and enjoy a wine and cheese reception at The ZLAC Clubhouse, hear Michael’s lifesaving stories, and purchase his new book. 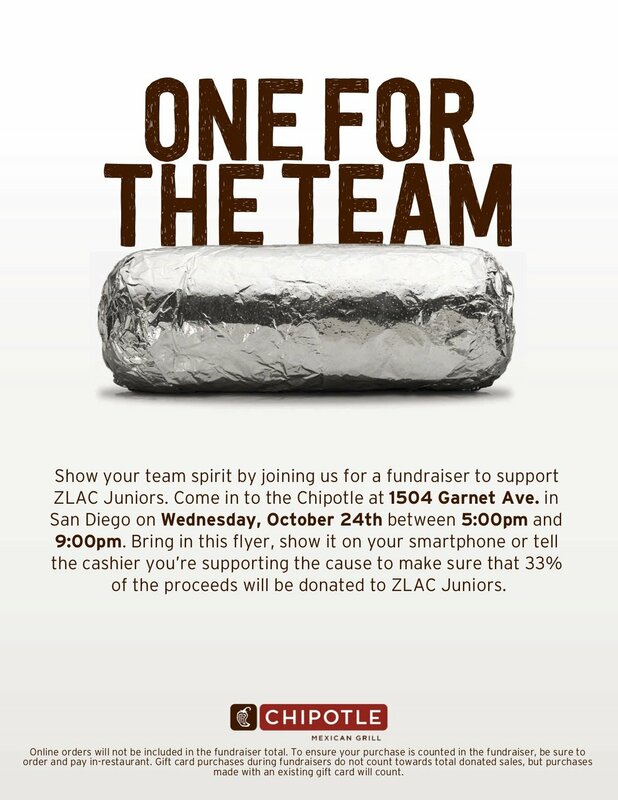 Support the Junior Rowers by eating at Chipotle, Wednesday October 24th from 5-9 PM! Click here for a printable version of the flier below. You may also show it on your phone or just mention it to the cashier. Make sure to order and pay in-restaurant! Celebration of 126 Years of Strong Women - on and off the water.